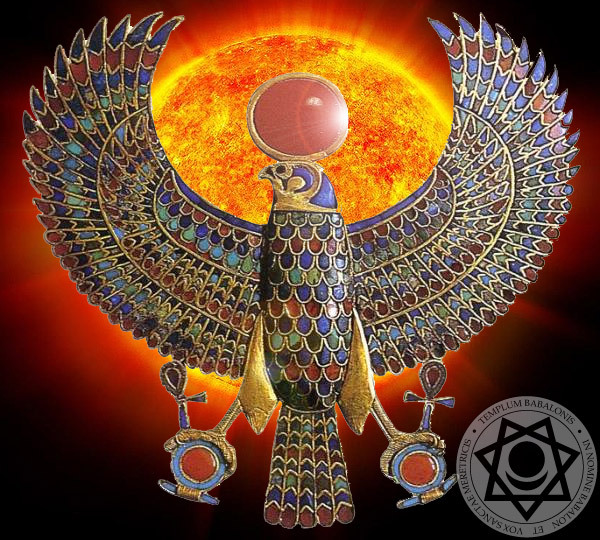 Ra-Hoor-Khuit is the active aspect of the Heru-Ra-Ha (the still aspect is Hoor-paar-kraat). And of all this the glory is so great that all the spiritual senses fail, and their reflections in the body fail.(... )This child danceth not, but it is because he is the soul of the two dances, - the right hand and the left hand, and in him they are one dance, the dance without motion." Ra-Hoor-Khuit is the Lord of the New Aeon (which began in 1904 e.v. according to Thelemic doctrine), and The Crowned and Conquering Child, the Lord of Mysteries, The One Initiator. Being the Child, He personifies and integrates all will, wisdom, love and light expressed by Nuit and Hadit. He personifies and brings new synergies into our existence, new depth and power to our cognitive processes, from within. But lets be frank, He is not out there, forever distinct from you and me; the qualities He personifies are an integral part of you and me, mirrored in the Godform of RHK. In terms of modern transpersonal psychology, RHK is a part of human overall Subtle transpersonal consciousness, just like all other godforms. RHK as our innermost Star, our true nature, is the answer to our yearnings on all levels of existence, for this inherent part of our transpersonal awareness is the ultimate positive power, glory, joy, courage and success light years beyond whining, passiveness, fear of sin, suffering, resignation to fate, victim mentality and other human tendencies. ...not by mere spelling, for this quality of our awareness demands not words, but actions. To RaHoorKhuit and to Light, Life, Love and Liberty in each of us this web site is dedicated.